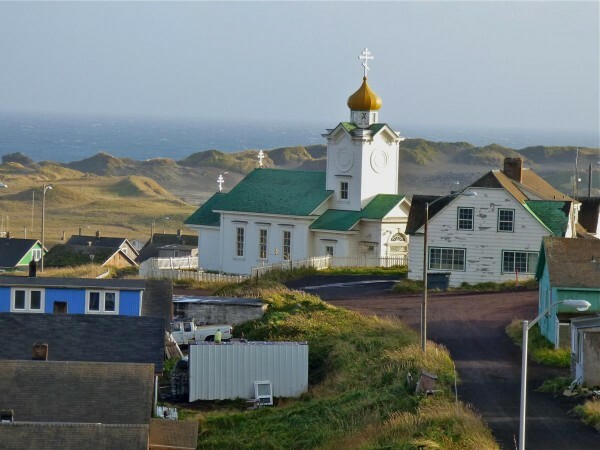 School enrollment in the Pribilof Islands has been shrinking in recent years, along with the islands’ fishing economy. As the superintendent of one of Alaska’s smallest and most remote school districts, Connie Newman wears many hats. The Pribilof School District has 10 students at its school on St. George Island and 71 on St. Paul Island. The lightly inhabited, windswept islands sit 300 miles off Alaska’s west coast in the Bering Sea. After declining enrollment forced cutbacks two years ago, Newman took on the mantle of St. Paul School principal as well as district superintendent. Now, in the predawn gloom before the start of the school day, she greets each St. Paul student as they hop down from parents’ SUVs or four-wheelers. 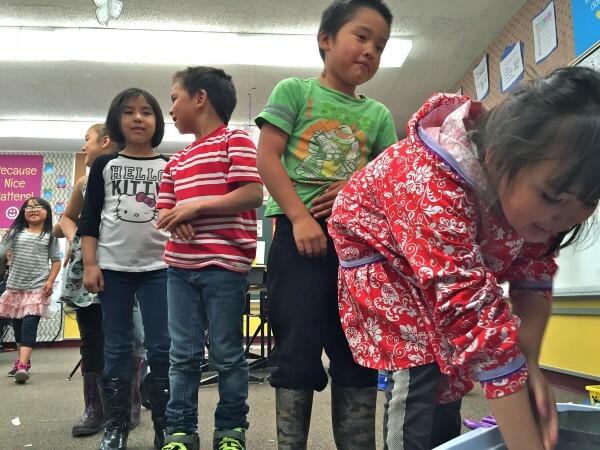 On St. Paul, the school day starts with a bilingual Pledge of Allegiance: first in English, then in Unangam Tunuu, the Aleut language. We spoke while Newman was sweeping the gym floor. St. Paul’s gym doesn’t see as much action as it used to. 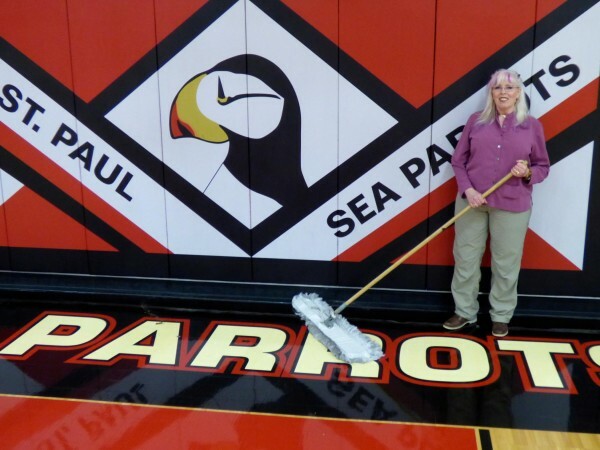 This is the first year the St. Paul Sea Parrots haven’t been able to field a basketball team. Some families have left the island; others have sent their kids to boarding schools in other parts of the state. While on a school field trip to learn about sea lion hunting, eighth grader Carley Bourdukofsky said she doesn’t really like going to school at St. Paul. Mt. Edgecumbe High School is a boarding school in Sitka. Ninth grader Sonia Merculief transferred to a boarding school in Galena, in the Alaska interior, this fall. Merculief said she got homesick at the isolated school on the Yukon River, so she came back to St. Paul. But she wants to try again. “I’m going to ask my mom this time if I can reapply for next semester,” she said. St. Paul does have course offerings that students can’t get elsewhere, like classes in Unangam Tunuu. 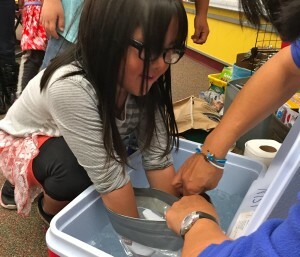 In October, the school hosts a week of locally focused science classes called Bering Sea Days. Every year, university scientists and local tribal officials converge on the St. Paul School to teach about the island’s biology and traditions. Guest instructors come from as far away as Texas and Oregon. The week is largely paid for by the Central Bering Sea Fishermen’s Association, the island’s fishing industry group. 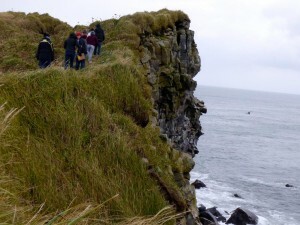 On field trips and in the classroom, students learn about the seabirds and seals that gather by the hundreds of thousands in the Pribilof Islands and the environmental changes that threaten the islands’ natural abundance. One group of students accompanied two local sea lion hunters as they scanned the surf at sunrise, looking for meat for the winter. Carley Bourdukofsky said she likes that part of the school year. “I like to learn new things and different things about our island,” the eighth grader said while out looking for sea lions. By lots of measures, the St. Paul School is struggling. Just 18 percent of St. Paul students met all state standards in English or math, according to the new Alaska Measures of Progress tests. Statewide, 35 percent of students met state standards in English and 31 percent met them in mathematics. A study done for the Alaska legislature this year found that the Pribilof district would have to boost salaries by 57 percent to attract and keep highly qualified teachers. That’s because of the high cost of living in the middle of the Bering Sea. A box of cereal can set you back nearly $9 at the Alaska Commercial store on St. Paul. A bag of pretzels? Nearly $10. Four out of five students on the island are poor enough to qualify for free or reduced-price lunches, nearly twice the statewide rate. But like many small schools in Alaska, St. Paul doesn’t serve lunch. It did offer snacks last year. “That was the Alaska Grown grant, which was discontinued due to the budget,” Connie Newman said. She said she has a great staff and supportive families on the island, but declining enrollment means less state funding. Newman said a driving force behind the school’s declining enrollment is something the school can’t do much about: people leaving the island in search of a healthier economy. “Our fishery has really been suffering, and we are allowed to take less and less halibut,” she said. The economy on remote, tundra-covered St. Paul revolves around halibut fishing, but the fish have been getting fewer and smaller. Warmer ocean conditions are apparently partly to blame; so is the fishing industry. In the Bering Sea, more halibut are caught accidentally and thrown away by Seattle-based boats trawling for other types of fish than the local halibut boats catch on purpose. The school got a bit of a reprieve in December from Seattle, of all places. Scientists with the International Pacific Halibut Commission announced that there’s enough halibut in the eastern Bering Sea to allow a “substantially larger” fishery next year. IPHC scientist Ian Stewart said the accidental catch, or bycatch, of halibut dropped this year. Politically appointed officials with the North Pacific Fisheries Management Council decide the actual catch limits. But the scientists’ announcement makes it less likely that families will be forced to leave St. Paul this school year. Reporting from St. Paul Island made possible in part by a grant from the Institute for Journalism and Natural Resources. St. Paul, Alaska. PHOTO: John Ryan/KUCB.